Back when I was living in NJ, one of my daughters favorite pastimes was a hole that she had dug in the ground in the middle of our yard. She would ask, "Mama, can I make mud?" I happily agreed and would turn on the hose for her and let her fill a watering can that she could use to mix the water and dirt. She would spend countless hours mixing, digging, unearthing worms and bugs and just having fun. Whenever her cousins came over she would show them the secrets of making mud, "Look you just mix dirt and water!" Soon everyone would be a wet, muddy mess, and while the other parents squirmed, I would be ecstatic. Now that we have become situated in Luxembourg and have a new garden to work with the first request of my daughter among others was, "Can we please make a place for mud so our garden can be fun?" I had never before thought of actually designating a space for mud play, but her request intrigued me. I did alittle research before hand to see what other moms have done in their gardens and to see what these "spaces" might look like. I found they were fairly simple and wonderfully entertaining. 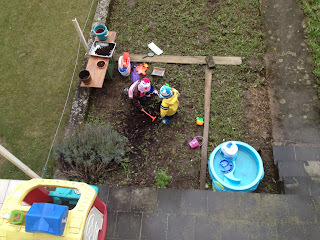 And so, together we created a space for mud play. Yes, this is picture of my son actually eating mud. I resisted the temptation to run and wash his mouth out and just let him get a taste and see what he did, unfortunately he just kept eating it ;) but on the plus side I found that there are many health benefits of playing with and in the mud and dirt. 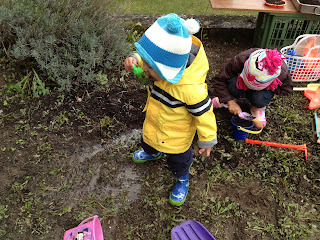 You can check out this link http://simplemom.net/let-your-kids-get-dirty/ to read about the 5 health benefits of getting dirty. 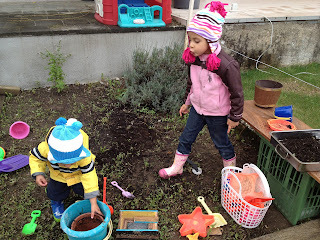 In our mud area I keep various objects such as shovels, pails, flower pots, magnifying glass, creature peeper, trucks, watering can, watering table and pots and pans that I had stored in my garage that were not being used. Ameera used one such pan to create a bug home. She filled it with soil and would place her bug findings and earth worms inside to examine and watch. I also keep a large plastic basket to store all these items and a wooden shelf I use as a table top by placing on top of the basket so the kids can work on. The kids play in the garden in rain or shine so rain boots and jackets are always made to good use. 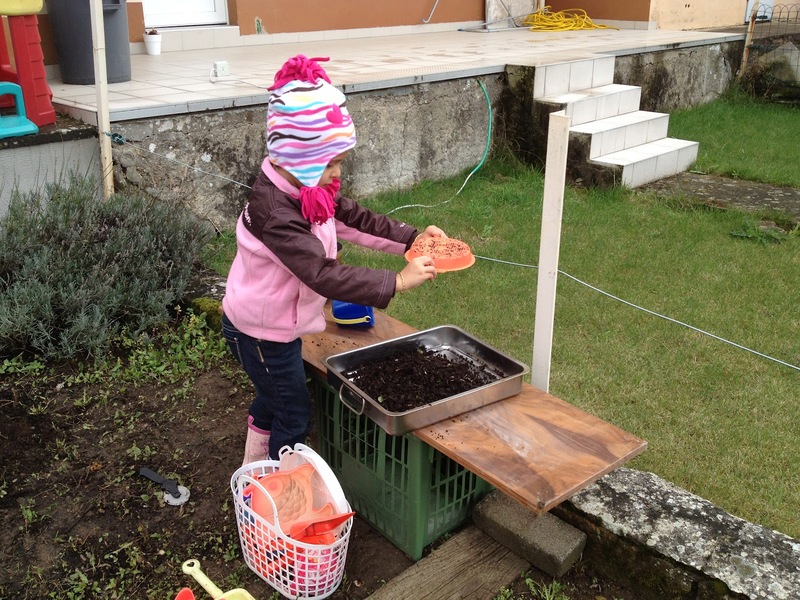 Backyards and gardens however small can be full of wonder and adventure for small children and are great for imaginative and creative play. Not to mention the wonderful conversations that arise from being outside. We have talked about weather, seasons, plants, insects, animals, gardening and about thankfulness and compassion for Allah's creation and how He alone creates everything in this world. For myself, I have found it to be very therapeutic and calming to be working on the garden, but I do not always go outside with them. I often leave them to play alone and find that they do much more interesting things when I am not present.